The traditional ruler of Bode Saa’du in Moro Local Government Area of Kwara State, Barrister Bola Yusuf, has commended the Buhari administration for rebuilding the Ilorin-Jebba Road. He said the road has boosted social and economic activities. 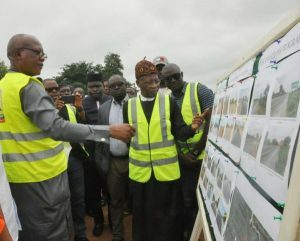 Barrister Yusuf, who is the Baale, gave the commendation in Bode Saa’du, a town along the newly-constructed single carriage way, on Friday, when the Minister of Information and Culture, Alhaji Lai Mohammed, inspected the construction of the Ilorin-Jebba-Mokwa-Birnin Gwari-Kaduna road. “We are indeed very grateful to the government. We cannot over-emphasize the importance of this road. There is no gainsaying that it has impacted on the economy and everything. When it was not done, it affected our people. Now that it has been done, every Nigerian who passes this road has kind words to say to the government. We have tasted and are still tasting the dividends of democracy, and it is our trust in God that it will continue by the special grace of God,” he said. The Ba’ale recalled that the deplorable state of the road, a key arterial road linking the South-West and the northern parts of the country, had forced a lot of residents to relocate. The traditional ruler said the reconstruction of the road has now reduced traveling time from Ilorin to Jebba from four days to about two hours.